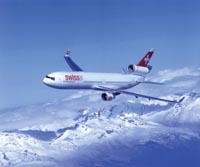 Swiss International Air Lines (SWISS) has introduced its new winter timetable. The new timetable will include an additional flight to Jeddah, while services to Iran will be discontinued. SWISS has also outlined its new European business concept. The introduction of the 'SWISS in Europe' fare system offers attractive low fares to all 41 European destinations. In the Middle East, SWISS operates a total of 25 weekly flights including daily, non-stop flights from Dubai, five weekly flights from Cairo, four times from Karachi, three times from Jeddah, Riyadh and Muscat. SWISS and British Airways have formally signed a new bilateral cooperation agreement recently as stated in their Memorandum of Understanding (MoU) of September 22, 2003. The new strategic alliance between the two airlines will see the establishment of code-share services, a joint frequent flyer programme and the provision of a $40 million guarantee for SWISS from BA.